One of the delights of Switzerland is the railway system. It runs on time no matter what the incline. 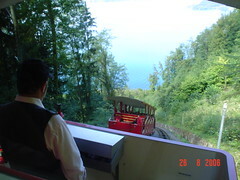 This funicular climbs 10o0 feet above Lake Lucerne. Here up and down are passing. This is a rack and pinion system pulled by cables.